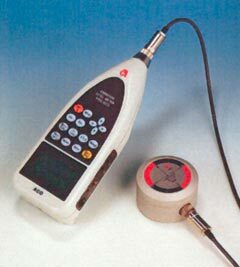 The TYPE 3233 conforms to measurement law JIS C 1510 1995, and exerts mobility at every measuring site because of its smallness and light weight. Combination/Integration with Vibration Pickup TYPE 7833 allows you to measure vibration levels and vibration acceleration levels on the ground, floor, foundation and seat etc., simultaneously in three directions of X, Y and Z. These can be simultaneously recorded on an external level recorder with output terminals independent in three directions. In addition, data processing has been simplified by integrating with peripherals using I/0 terminal (RS-232C interface). 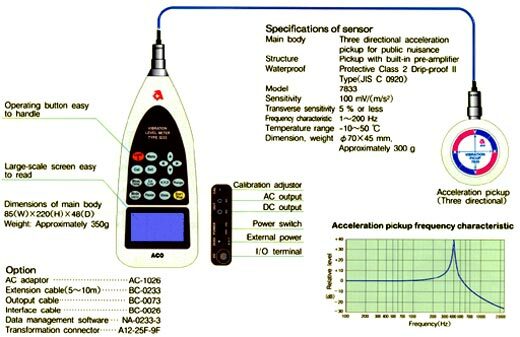 ACO's Sound Meters, TYPES 6224/6226, having the equivalent specifications, are also on sale as popular comparison meters. Please make use of these in combination with the measuring instruments for environment control. Wide range of linearity 75 dB eliminates switching. Maximum and minimum values (Lmax, Lmin), Percentile vibration level (Ex; five values) and power average are computed simultaneously in three directions, and selectively displayed. time in three directions simultaneously.